The official launch of the Australia One process was held in Adelaide in September 2016, and was attended by the then-world leader of The Salvation Army, General André Cox. From 1 December 2018, The Salvation Army in Australia will once again be one territory. Officially announced on 1 March 2016 by then-international Chief of the Staff, Commissioner Brian Peddle, the process to unify the Australia Eastern and Southern territories has been a journey that has spanned more than two-and-a half years. Now the world leader of The Salvation Army, General Peddle has made the long journey from London again to officially launch the new Australia Territory this week during the Still Others celebration in Melbourne that began on 27 November and continues until 3 December. 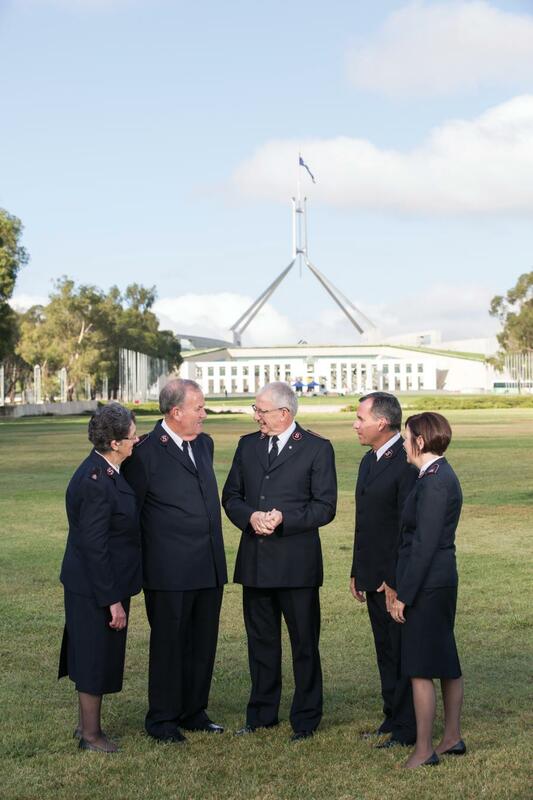 The transition to an Australia Territory has been a challenging journey; for senior leadership, Salvationists, employees, volunteers and others who have a strong connection to The Salvation Army. Major Farthing’s reflection is apt; the emotional energy expended by so many during this journey – particularly around the many hard decisions that have been made – has been significant. The long term gain, however, far outweighs any short-term pain as The Salvation Army repositions itself for effective mission in 21st-century Australia. The Salvation Army in Australia was last one territory in 1921, when the Australia Eastern and Australia Southern territories were formed. From 1886, Australia was part of the Australasian Territory, which incorporated all of Australia and New Zealand, with headquarters in Melbourne. New Zealand became a single territory in 1912, leaving Australia as a stand-alone territory until the formation of the separate Australia Eastern and Southern territories on 1 January 1921. Active discussion on the return to one territory for Australia has been going on for the past 25 years between leaders of the two current Australian territories and the Army’s International Headquarters, according to a document produced in 2015 and titled “Australia One”. The document was prepared to explain the decision and process to create a new, single Australia Territory. Retired Canadian officer Colonel Glen Shepherd was engaged to conduct an independent review of the proposal in 2015. His task, according to the Australia One document, was to undertake “a study to determine the case for the unification of the two territories into one national administration”. Colonel Shepherd consulted with territorial and divisional leaders, members of territorial advisory boards, key employees and officers. In all, 45 interviews were conducted, with 76 per cent of interviewees saying they either “fully endorsed” or would “support, with a need for certain cautions”, the unification. In January 2016, the then-territorial leaders of Australia Eastern (Commissioner James Condon) and Australia Southern (Commissioner Floyd Tidd) (pictured right with then Chief-of-the-staff Brian Peddle), after consultation with cabinet members from both territories, and Colonel Shepherd recommended to The Salvation Army International Management Council that the two territories commence the amalgamation process. • Unification would produce other synergies in terms of fundraising, government relations, public messaging, purchasing contracts and competitiveness for government contracts to help Army mission. The International Management Council agreed with the recommendation and then-world leader of the Army, General André Cox, gave his approval. And so the process to create a new Australia Territory began in earnest. The recommendation to establish a Mission Development Endowment is one that merits further explanation. It has been adopted by those charged with overseeing the transition to one territory and is now referred to as the Mission Endowment Fund (MEF). The potential impact of the MEF is significant. Once realised, annual savings created by the unification will be placed in an endowment fund, with the proposal paper drawing projections (based on average investment returns) that 10 years from establishing the fund, it could be paying out in excess of $10 million per year. All of that money would be used to support frontline mission. Additionally, the design of the MEF means that the amount available for mission support each year should continue to increase. To ensure that this objective is realised, an MEF Steering Committee, chaired by National Commander Commissioner Floyd Tidd, was established to help identify and capture cost efficiencies resulting from the amalgamation. The Mission Endowment Fund has been created and progress reports on contributions to, and the growth of, the fund will be regularly reported through to the Australia Territory Board. Commissioners Floyd and Tracey Tidd were officially installed as national leaders of The Salvation Army in Australia by General Cox in Adelaide on 17 September 2016 (pictured right with Colonels Mark and Julie Campbell and Commissioner Sylvia Cox). As National Commander, Commissioner Tidd has consistently emphasised the “why” of the creation of an Australia Territory. Sitting alongside the development of a new National Vision Statement and a National Strategy, has been the creation of six “whys”. They are: Aligned Vision; Increased Innovation; United Voice; Stronger Partnerships; Better Stewardship; and Greater Impact. In fact, these “whys” have been around since day one of the transition process, having been included in a staff information pack that was released on that momentous day in March 2016 when the unification was announced. Commissioner Tidd has repeatedly referred to these six “whys” throughout the transition to one territory. “We are about building a stronger and more effective Salvation Army, ready and available to God for the new thing he is doing in this nation,” he says. Accordingly, during the official launch of the new Australia Territory in Melbourne by General Peddle, these six key reasons have featured as the driving force behind this bold venture. 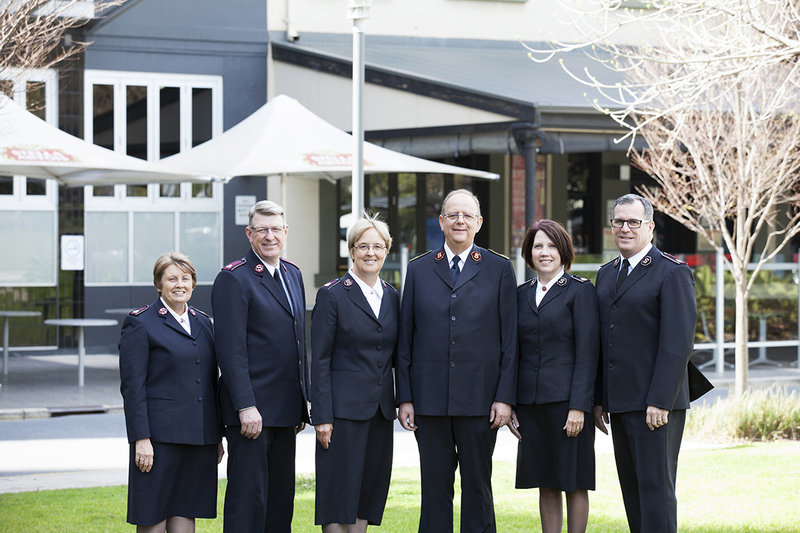 They have directed this national journey, guiding The Salvation Army in Australia throughout the transformation. And they will continue to do so, recognising that the national transition process to date is just the start of a broader change journey. 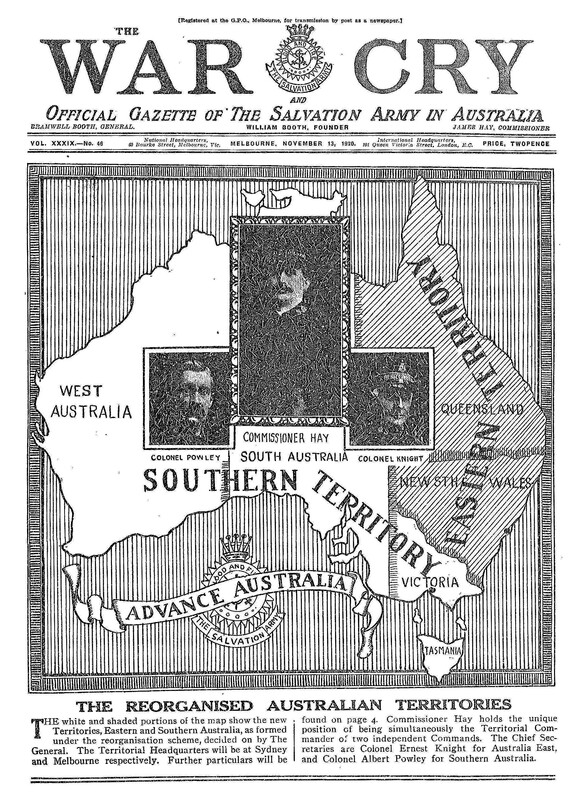 The process to unify the Australia Eastern and Australia Southern territories into The Salvation Army Australia Territory, though, is perhaps most appropriately captured by the simple joint statement that Commissioner Tidd and Commissioner Condon made right back at the start of the process. * The strong level of support for a single, united Australia Territory has been confirmed in the regular Pulse Surveys that have been conducted throughout the national transition process. In the most recent survey, 76 per cent of the 2257 people who responded agreed that the transition would benefit the people we serve and all Salvos. Additionally, 80 per cent said that they felt a personal connection to the new National Vision Statement, and 79 per cent said that felt motivated to contribute to the success of the Australia Territory. Scott Simpson is the National Assistant Editor-in-Chief. Read the reflections of 10 Salvationists on What does an Australia Territory mean for me?